There's so many things I love about Virginia wine country, but one of my favorites parts about it are the incredible views. If you're ever in Virginia wine country and need an awesome experience, I highly recommend Bruce Schutte, from Wine Pro Tours. Bruce picked me up at my hotel at The Salamander Resort and drove me through the beautiful countryside to Linden Vineyards. Nestled on top of a hill overlooking the Blue Ridge mountains, Linden Vineyards offers delicious artisan wines and the most spectacular picturesque views. CLICK HERE to read my last article on Virginia Wine Country. Since 1987, Linden Vineyards has been producing wines in the Blue Ridge Mountains. This winery is also recognized, as one of the early pioneers in the Virginia wine industry. Jim Law, winemaker and owner, purchased his fruit farm in 1983 with his first vintage producing in 1987. “Never content, always improving”, is how Jim Law defines his vineyards and artisan approach to winemaking. He is an advocate of vineyard designated wines with less intervention. Producing 4,000 cases per year, Linden Vineyards is making wines that are unfined or unfiltered, striving to get as much concentration from the grapes as possible. Their 2016 Riesling was zesty, with light acidity and a refreshing dry crisp finish, a perfect representation of a Linden wine. (Riesling pictured bottom left). Jim Law states that he strives to maintain a constant state of experimentation and learning what varieties are more important to his soil. There’s some controversy with Jim Law, in that he is outspoken about his belief that wineries should focus on producing high quality wines and not venues for weddings and festivals. The increase success of the winery has caused the deck to be over packed with tourists on the weekends. This resulted Jim to make the tough decision to restrict the deck on the weekends for wine club members who purchase one case of wine a year. Linden Vineyards is Jim Law’s home and does not entertain tastings for parties larger than six guest. So if you're in the mood for a winery that offers delicious wines, a quiet ambience and a place to sit and relax, then make sure you stop by Linden Vineyards. 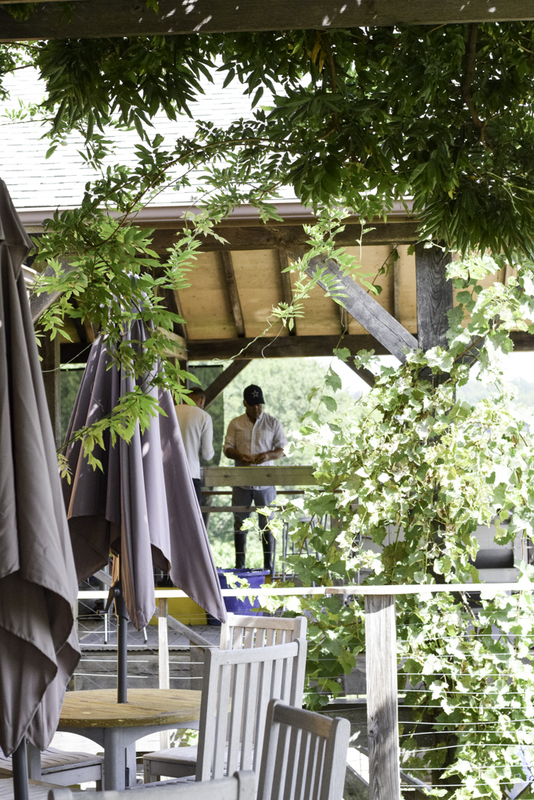 Their tasting room and outdoor deck is one of the most peaceful and quiet places to sit and drink a glass of wine with the most incredible views of the Linden property and the Blue Ridge Mountains. Winter Hours: From December through March Linden is open on Saturdays and Sundays from 11 a.m. to 5 p.m.. We will also close for the holidays from December 18, 2017 until re-opening Saturday, January 6, 2018. Summer Hours: From April through November Linden is open from 11 a.m. to 5 p.m. on Fridays, Saturdays and Sundays. Children are allowed at Linden if accompanied by well-behaved adults. By law you have to be 21 years of age to taste wine. This is a pretty boring place for kids.